Transient Voltage Surge Suppressors (TVSS), also more commonly referred to as Surge Protective Devices (SPDs), have been applied as part of an overall power quality strategy for almost a decade. Moving into the future of utility deregulation and the increased reliance on electronic devices to control, process, and communicate information, SPDs will continue to be recognized as an essential component of power quality. However, because SPDs have only been utilized for the past ten years as part of a power quality strategy, there are many issues that cloud the safety, performance, and the correct application of the device. In the United States, many documents have been produced to evaluate both the performance and safety attributes of SPDs. Many of the documents have been produced by the telecommunication companies who are in the process of building the internet and enhancing the telecommunications infrastructure. Additional documentation has been provided by independent organizations which address the performance and safety aspects of SPDs: the National Electric Code (NEC), the Institute of Electrical and Electronic Engineers (IEEE), and Underwriters Laboratories, Incorporated (UL). The IEEE has been very active in providing recommendations and guidelines that help engineers correctly describe transient environments, and help to identify the many attributes of a correctly applied SPD. The most notable IEEE document on surge environments is titled IEEE Recommended Practice on Surge Voltages in Low-Voltage AC Power Circuits, standard C62.41-1991 . The IEEE has also authorized a working group to explore and provide guidelines that will help engineers in the application and specification of SPDs. To ensure the coordination of a SPD to the distribution network of application, the IEEE Guide for the Application of Surge Protective Devices in Low-Voltage AC Power Circuits, Draft 5 recommends that the interrupt current ratings of all devices within a particular panel be equally rated . If the available interrupt current (AIC) rating of the SPD is less than the panel, then the SPD has been incorrectly applied. Testing of the SPD to determine the available interrupt current (AIC) rating is accomplished by an evaluation to Underwriters Laboratories, Incorporated (UL), standard 1449  and is defined in Section 37.3. The conformity to this requirement was required by the implementation of the second edition of the standard dated 1996 August. Testing consists of subjecting representative samples of a particular SPD model or product line to an over-voltage condition with a specified short circuit current. Testing is only performed on single-, split, or three-phase wye configurations. Three-phase delta configurations are not required to be tested. SPDs are subjected to the maximum system voltage present with the available fault current limited only by the effective source impedance. Three representative samples are tested in a single mode configuration, i.e. line-to-neutral, line-to-ground, or neutral-to-ground. At the completion of the test, the SPD can not have any holes in the enclosure that could result in the accessibility of live circuits, produce a flame that damages the cheese-cloth that surrounds the SPD during the test, or ignite the enclosure. The amplitude of the short circuit fault current is determined in advance of the test procedure by the manufacturer of the SPD. Table 1 shows the amplitudes of the fault currents possible. It is important to note, the method of disconnect may be internal or external to the SPD. Either way, once the representative samples of the parallel SPD products have been evaluated by UL, all production models are required to have documentation available to the end-user indicating the maximum fault current of the SPD. This documentation can be provided in the form of a label on the product or within the installation instructions. The best way to illustrate the incorrect and correct application of a SPD in accordance with the codes, guidelines, and conditions of acceptability by the NEC, the IEEE, and UL respectively is by example. Table 1. The amplitude of the short circuit fault current is determined in advance of the test procedure by the manufacturer of the SPD. Table 1 shows the amplitudes of the fault currents possible. For example, assume that a SPD has obtained an available interrupt current (AIC) rating of 25,000 amperes from UL. Assume that this particular SPD was placed behind a circuit breaker with an AIC rating of 65,000 amperes, as shown in Figure 1. Additionally, assume that the maximum AIC present to this particular location on the facility’s power distribution system is 42,000 amperes. In this particular example, the SPD is incorrectly applied. Because the SPD has obtained an AIC rating of only 25,000 amperes, it may not be capable of withstanding an interrupt current of 42,000 amperes. To rectify this particular example so that the SPD has been installed in accordance the NEC, the IEEE recommendations, and UL conditions of acceptability, a few approaches can be considered. The first approach would be to apply a SPD with an AIC rating of 42,000 amperes or greater. 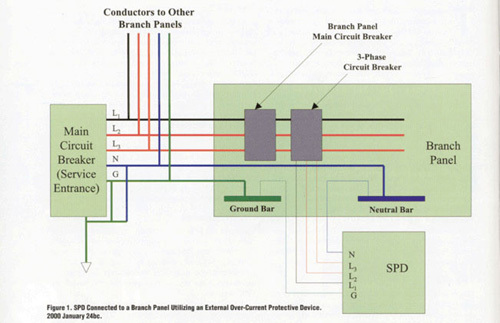 Even though the circuit breaker proceeding the SPD is greater than the SPD, the maximum short-circuit current available at the panel is 42,000 amperes. Therefore, the SPD has an AIC rating equal to the power distribution system at that point. The second approach is to utilize a current limiting circuit breaker that will limit the AIC to the SPD to a value of 25,000 amperes or less . This option presents some complications. In accordance with the NEC, the device must be applied in accordance with its listing requirements. Testing of the SPD must be with a specified circuit breaker at a specified current rating. Using a circuit breaker produced by a different manufacturer, at a different AIC rating, or even a different part number is not acceptable and is outside the scope of its safety agency listing. If the SPD is installed utilizing an untested or improperly tested current limiting circuit breaker, then it is the same as not utilizing a product evaluated by an independent safety agency, such as UL. 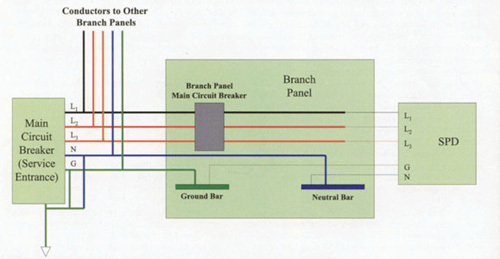 The third approach would be to install a finite amount of impedance in the line prior to the panel. 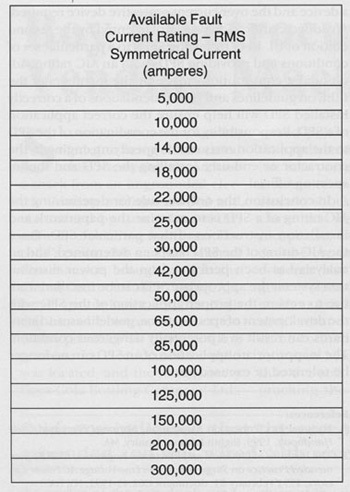 The amount of impedance would have to be high enough to limit the amount of AIC to 25,000 amperes or less. One particular way to implement this action item is by installing a transformer in the power distribution system to lower the overall AIC rating at that particular point. This option can be very expensive and may require additional space to incorporate. Figure 2 represents a SPD that includes the over-current protection within the device itself. In this case, the SPD does not require that the device be preceeded with a circuit breaker. However, the same rules apply. The SPD has a specified AIC rating which has been evaluated by UL, it is marked either on the product or in the accompanying installation instructions, and must be connected appropriately. As SPDs have become a common device in the overall picture of a complete power quality strategy, their performance and safety attributes have continued to be examined and tested. Among one of the top attributes has been the safe and correct application of a SPD to a facility’s power distribution system. Analysis of the AIC ratings of the power distribution system, any over-current protective devices, and the SPD itself is required. The NEC long ago established rules determining the relationship between the available interrupt current of a device and the over-current protective device required. An added clarification was implemented by the second edition of UL 1449 by testing SPDs to a particular set of conditions and providing SPDs with an AIC rating. Additionally, contributions made by the members of the IEEE on guidelines and recommendations of a correctly installed SPD will help ensure the correct application of a SPD. Responsibility for the coordination of the SPD to the application rests on the specifying engineer, the contractor or end-user installing the SPD and the inspecting official. In conclusion, the only set rule for determining the AIC rating of a SPD is to examine the paperwork and installation instructions of that particular SPD. Once the AIC rating of the SPD has been determined, and an analysis has been performed on the power distribution system, the appropriate SPD can be installed. Failure to ensure the proper application of the SPD with the development of specifications, guidelines, and standards can result in a potentially dangerous condition. The inappropriate application of an SPD can no longer be tolerated or excused. 1. National Fire Protection Association, National Electrical Code Handbook, 1999, Eighth Edition, Qunicy, MA. 2. The Institute of Electrical and Electronic Engineers, IEEE Recommended Practice on Surge Voltages in Low-Voltage AC Power Circuits, 1991 February 21, document C62.41-1991, NY, NY. 3. The Institute of Electrical and Electronic Engineers, IEEE Guide for the Application of Surge Protective Devices in Low-Voltage AC Power Circuits, Draft 5, 1999 document PC62.72, NY, NY. 4. Underwriters Laboratories, Incorporated, Standard for Safety, Transient Voltage Surge Suppressors, Second Edition, 1996 August 15, Melville, NY. 5. The Institute of Electrical and Electronic Engineers, IEEE Recommended Practice for Electric Power Distribution for Industrial Plants, IEEE Red Book, IEEE Standard 141-1993, page 217, NY, NY. Bryan Cole is director of engineering for Liebert/Control Concepts, a division of Emerson Electric. Bryan has been involved with the research and development of one-port and two-port surge protection devices, electromagnetic interference (EMI) filters, and harmonic filters for eleven years, nine of those at Control Concepts. Bryan also manages all safety agency and compliance operations. Bryan received a Bachelors degree in Electrical Engineering from Binghamton University, and is currently pursuing a Masters degree in Electrical Engineering from Binghamton University. He is currently a member of the IEEE's Power Engineering, Power Electronics, Engineering Management, and EMC Societies. Bryan contributes to the IEEE's Power Engineering working group 3.6.4, characterizing the surge environment, and is a member of the working group 3.6.6, which is developing an application guide for surge protective devices.